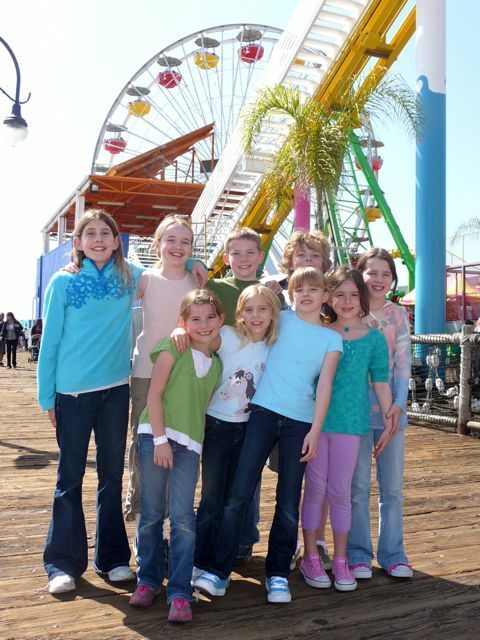 Two years ago this month, when we were still living in Los Angeles, we helped our daughter celebrated her 8th birthday party at "Pacific Park" on the Santa Monica Pier. I dropped everybody off at the entrance and parked our van. 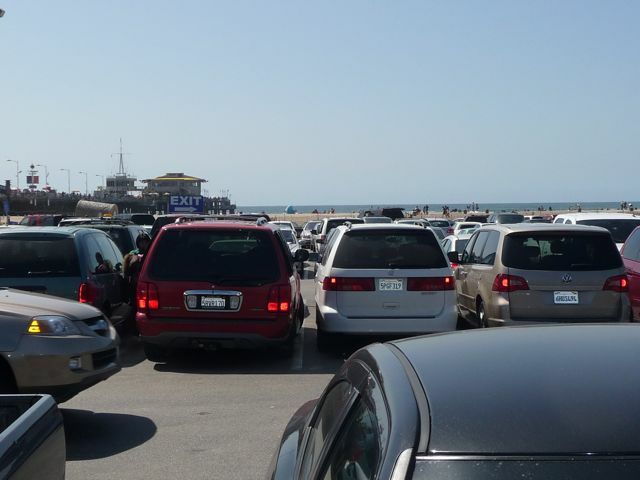 Parking is $10. If you're planning on going on the weekend, get there early, as the lot does fill up. 2) the fact that I insisted on shoehorning myself into it. 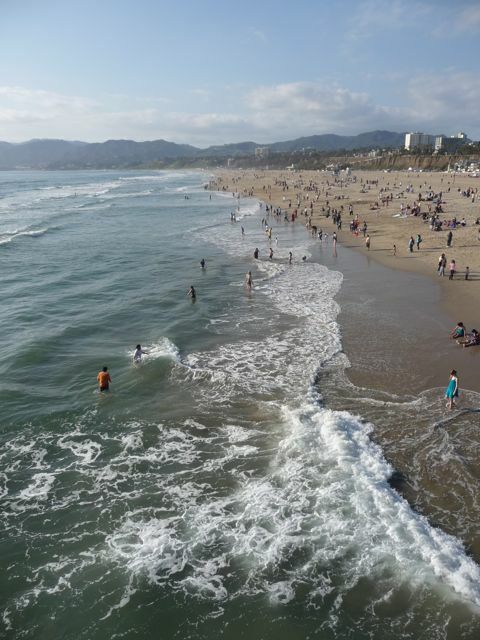 Whether you live in Southern California or are just visiting, you owe it to yourself to experience the Santa Monica Pier. It's got something for everyone, including the world's largest solar powered ferris wheel. If you want to really experience a sea-side amusement pier, don't waste your time and money at the Disney California Adventure - visit something authetic! This is the real deal. 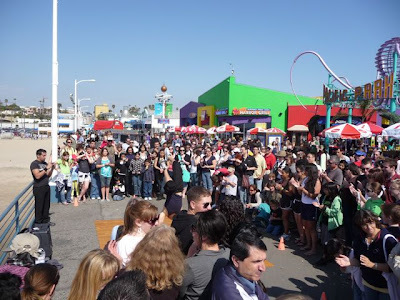 And "admission" (that is, walking around the pier, or it's little "Pacific Park" amusement park) is free. Of couse, the rides cost. 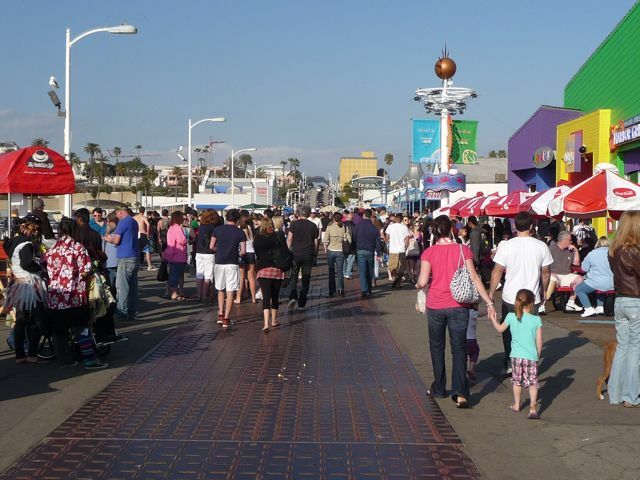 You can buy individual tickets, but most people buy unlimited day passes. 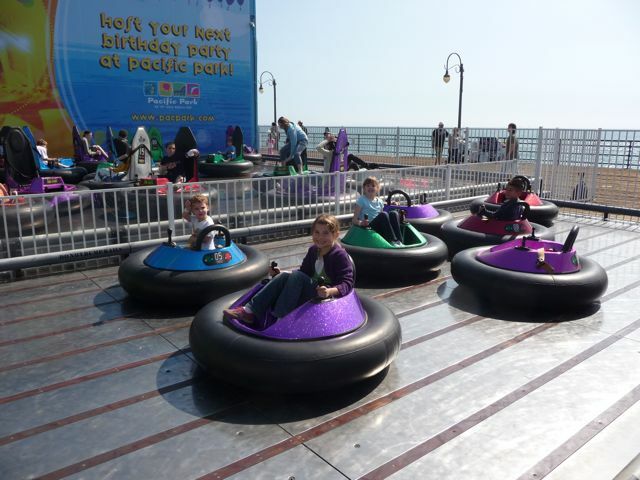 Something for everyone: my dauther and her cousin on the bumper cars. 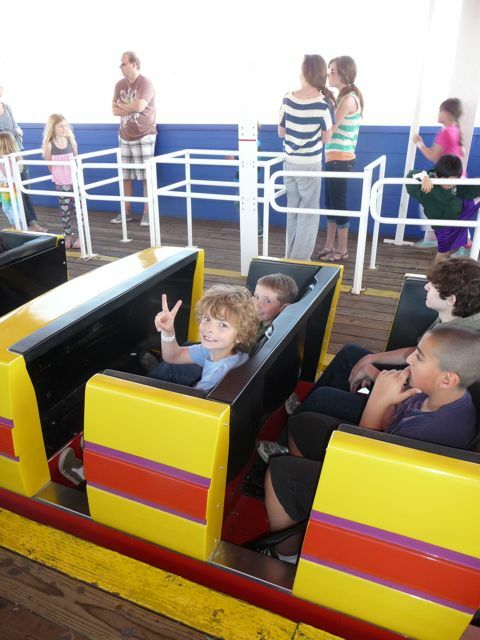 My son and his cousin on the spinner. Another group shot before getting on the rollarcoaster. 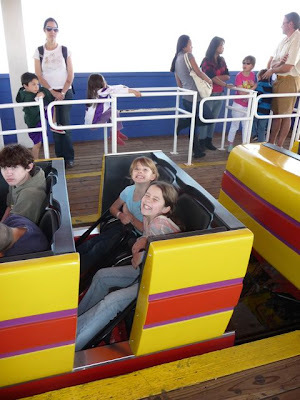 Because we had a group of ten kids, we were able to get all-day unlimited ride tickets for just $12 each. 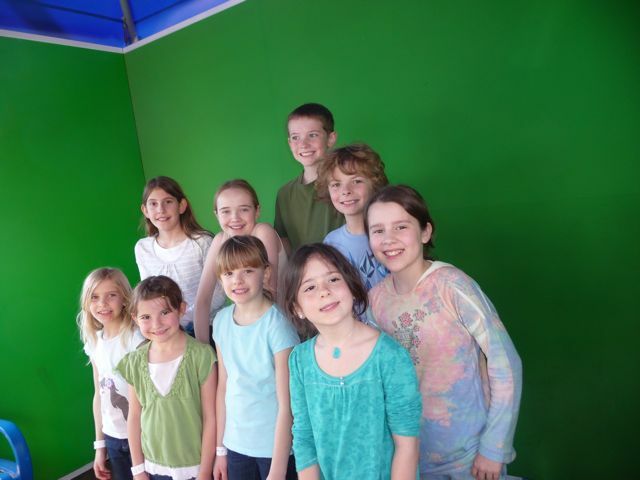 THAT was an amazing deal (it was a birthday party: go ahead and try to rent a bounce house for that price!). OK, the roller coaster is pretty tame. Six Flags it's not. 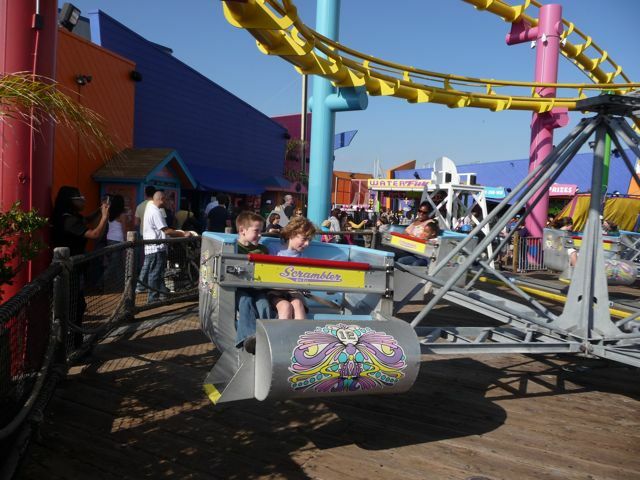 But it's got some great views of the city and the ocean, has authentic sea breezes, and is great for younger kids. My son and his cousin. Remember, this was two years ago. He decided soon after this he didn't like "big hair". 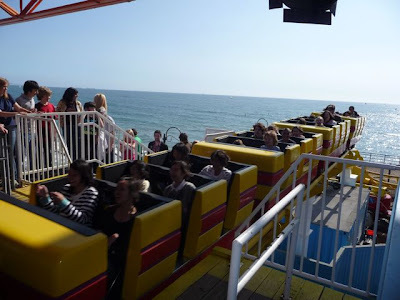 No, the roller coaster doesn't actually go out over the ocean, but it get pretty close. ... for some amazing acrobatic tricks. Of course, you'll want to drop a tip in the bucket. These guys don't get paid, otherwise. The view looking north. 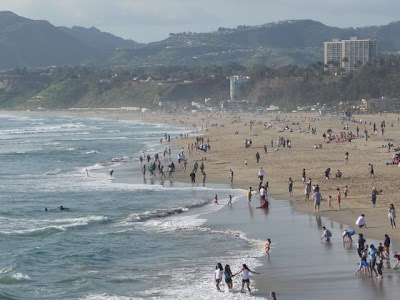 While the rest of the country was dealing with snow (at least that was the case in 2010), our little birthday party group and several thousand other Angelenos were enjoying a day at the beach. Another view. Pretty incredible for mid-March. Ironically, Santa Monica is actually colder in May and June when Southern California experiences a thick marine layer along the coast. Having grown up in Los Angeles in the late 1960's and 1970's, I can honestly say that the Santa Monica Pier is better and safer family experience than it was 30-40 years ago. Great place to spend a few hours, or the whole day. 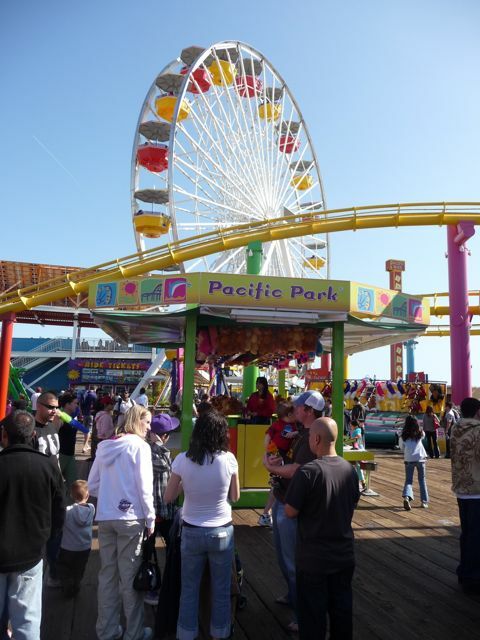 Here's a link to the Santa Monica Pier's "Pacific Park" amusement park area's website. Enjoy. Oh wow, all this looks super enjoyable. 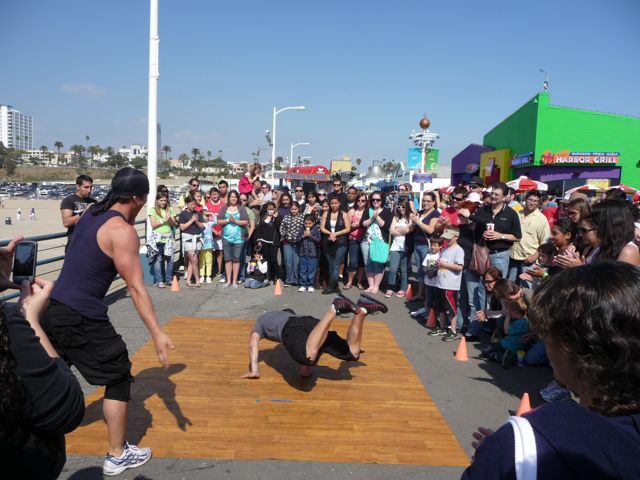 I am way too impressed to have a glimpse into this event through these pictures. At one of the local LA venues we also attended a carnival themed birthday bash recently and it truly turned out to be just outstanding.